Interview with Jaime Teo and Quek EeMeng, Ambassadors of Standard Chartered Marathon Singapore 2016 | JustRunLah! STANDARD CHARTERED MARATHON SINGAPORE WILL TAKE PLACE ON 3 – 4 DECEMBER 2016 AT ORCHARD ROAD. Early bird registrations for Standard Chartered Marathon Singapore (SCMS) 2016 are available now! Register quick to secure your slot before they sold out. 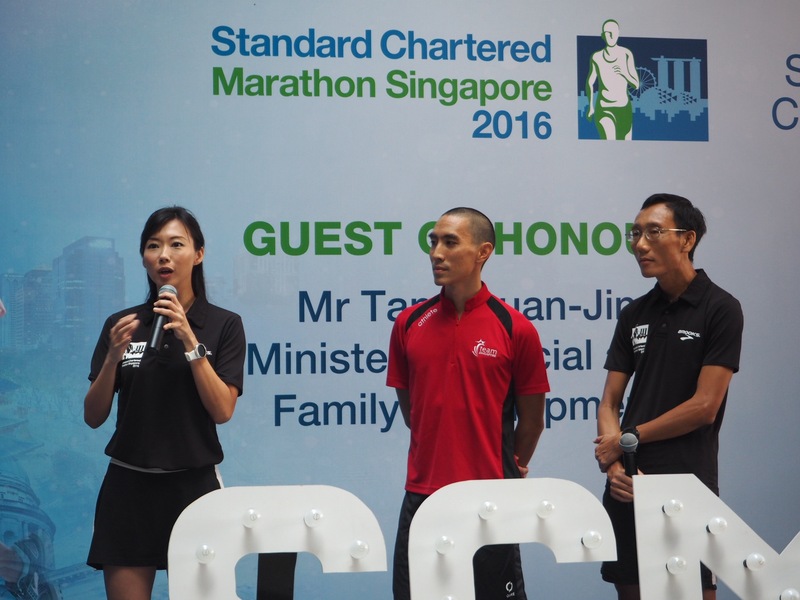 To find out more about SCMS 2016, meet their ambassadors – Jaime Teo and Quek EeMeng! 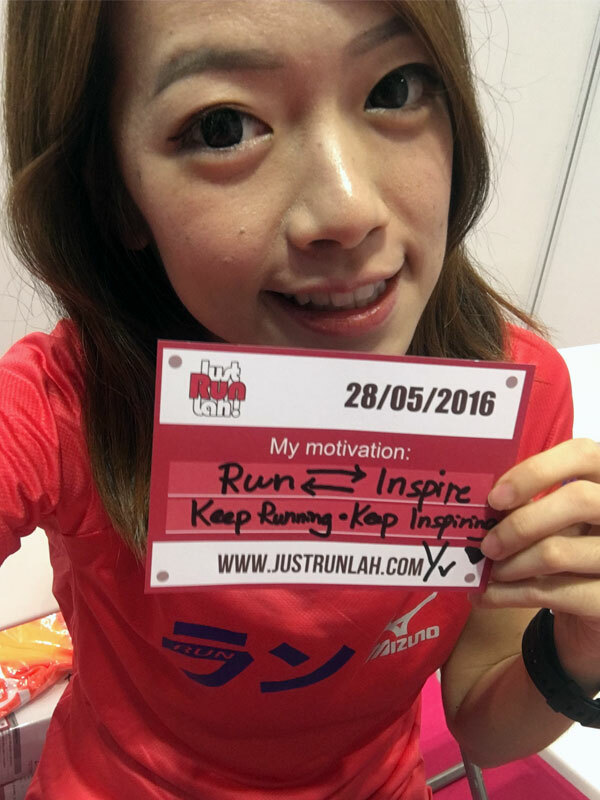 Hear what makes them run and join this Singapore’s premier running event! Jaime Teo sharing about her running experience in SCMS 2016 Launch Roadshow. Jaime Teo is a Miss Singapore Universe 2001, a celebrity mom, entrepreneur – and co-owner of Twelve Cupcakes. She will be adding finisher of the Standard Chartered Marathon Singapore to her list of accolades when she participates in the race for the first time this December. The multi-talented fitness advocate will not be alone as her six-year-old daughter, Renee, will also be participating in her first Kids Dash. Jaime: Hello! My name is Jaime Teo and I’m a sports lover. Running is a sport so I guess I love running too! Jaime: When I was in secondary school, I would always be picked to do the long distance runs but of course at that age, 300m is a long distance. I found enjoyment in winning those races because it was very much mind over body. Since then I’ve been active but not like in the last 2.5years when I felt the need to get fitter as I got older so that I can keep up with my daughter as well as feel younger. It has taken awhile to get back to running because there are frankly so many other sports that I enjoy!! But making the decision to sign up for a 10km is as good as motivation as any other. I love a challenge! JustRunLah! : “CONQUER THE DISTANCE, GO BEYOND”, what does the slogan mean to you? Jaime: To me, it means that the conquering of the mind is more important than the distance. Jaime: It is ok to start slow, and to start with shorter distances. Just don’t stop! Jaime: Running is convincing yourself with every run, to do faster or further. 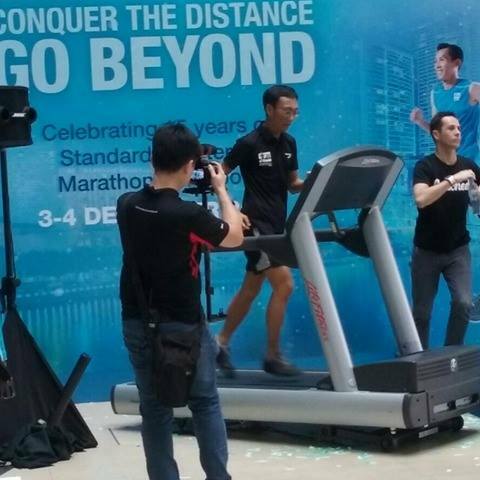 Quek EeMeng took on a treadmill test to determine his baseline fitness in SCMS 2016 Launch. A familiar face in the running scene in Singapore, EeMeng has participated and completed the past 14 editions of the Standard Chartered Marathon Singapore. This year, he hopes to celebrate his landmark 15th race together with the Marathon’s 15th anniversary! EeMeng: Leisure runner who occasionally join a competitive race. EeMeng: First pick up marathon running in 1990 because unable to complete in a full marathon in 1985 before serving NS. Also starting beyond 42km in 1991 after completing the first full marathon. 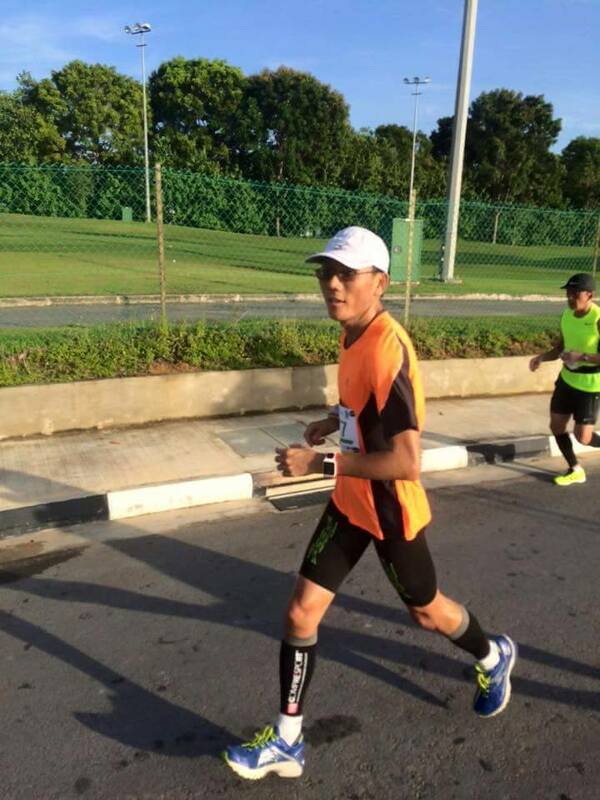 Quek EeMeng is also a seasonal ultra runner that completed 101km in Singapore! JustRunLah! : “CONQUER THE DISTANCE, GO BEYOND”, what does the slogan means to you? EeMeng: Running need perseverance and discipline in training. EeMeng: Don’t give up. Begin with a short distance, be it 1km or 2km or 10min to 20 min and progressing increase the distance or duration. EeMeng: Running is my habit. Ready to take up the challenge with SCMS Ambassadors? 10km Wheelchair, Individual 10km, Half Marathon, Full Marathon, Ekiden, or even 800m Kids Dash – There’s always a category for you! Make your decision now and start training for your big day on 3 & 4 December 2016. The early bird slots are selling fast, grab the chance! Click here to sign up Standard Chartered Marathon Singapore 2016 now!